Sauber und mit allem ausgestattet, was man braucht! 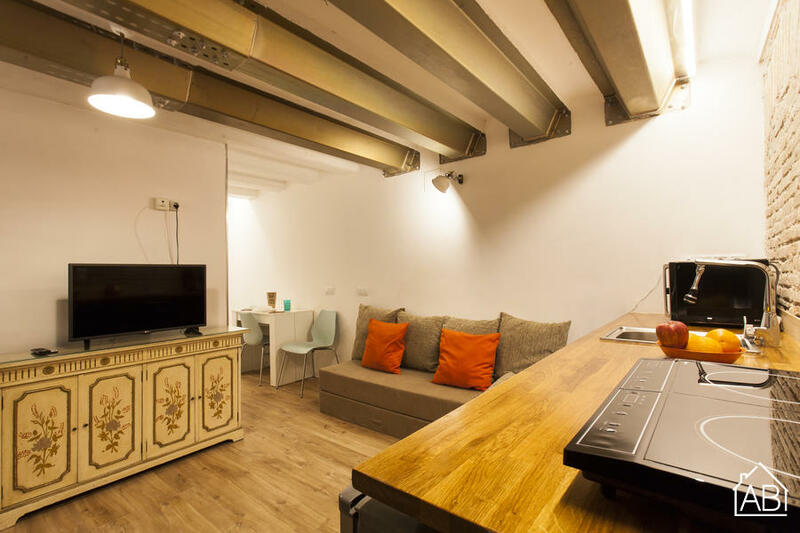 This cosy studio apartment in Barcelona is located in the hip area of Sant Antoni.The neighbourhood is becoming an increasingly popular place to dine out or have a drink. What’s more, it’s located just next to the equally trendy Poble Sec and the Eixample area - perfect for those looking to make the most of their time in the city and stay in the heart of all the action. This lovely apartment is the ideal choice for couples looking for a cosy space for their stay in Barcelona. The exposed brick walls combined with soft, warm lighting gives the studio a romantic atmosphere. The modern kitchen is fully equipped with a microwave, cooker, juicer, kettle and toaster as well as pots, pans and cutlery. After a long day in the city you can unwind and relax on the sofa or comfortable double bed and watch television. The apartment has a maximum capacity of two guests and features a modern bathroom with a walk-in shower. There are plenty of amenities in this apartment for your convenience, such as a washing machine, WiFi, heaters and a flat-screen TV, making this a perfect choice for your home-away-from-home in Barcelona.